The number of births in Virginia continues declining, reaching the lowest level in years in 2017 — only 100,248. A decade before, births had numbered 108,884. Demographers Savannah Quick and Shonel Sen at the Demographics Research Group at the University of Virginia attribute the overall dip in fertility decline to a dramatic decline for 15- to 19-year-olds and 20- to 24-year-olds and a slight increase for 30- to 24-year-olds and 35- to 39-year-olds. In other words, many women are postponing childbirth, not choosing not to have children. This is a classic good news/bad news story. The good news is that more women are taking control of their fertility in order to pursue education and improve their job prospects before having a child. Modern-day child-raising is an exhausting, all-consuming activity. It is all but impossible for women to hold down a full-time job, raise a child (or children), and continue their education — especially if there’s no father in the picture. The persistence of poverty in a society characterized by abundant avenues for upward mobility is, at its heart, a demographic issue. If lower-income women are having fewer children, fewer children will be raised in poverty. The bad news is that the United States needs more citizens to enter the workforce and pay payroll taxes to help support a Medicare and Social Security system that is careening toward fiscal insolvency. But incremental changes in fertility are unlikely to make much difference. The Medicare and Social Security trust funds will dissipate before children born today can enter the workforce. This entry was posted in Demographics, Poverty & income gap and tagged Boomergeddon, James A. Bacon. Bookmark the permalink. There is your issue: United States needs more citizens to enter the workforce and pay payroll taxes. Get more people off the dole and onto work, of any type. Making birth control readily available to young women is finally turning the tide and the fewer kids born into poverty of parents who themselves are barely in their 20’s is a good thing. Our bigger challenge is that we not only need more workers – but do workers on the lower end who perform service jobs – end up costing us more money than they contribute in taxes? I read a study where the retirement age would need to go to 80 in Korea, 75 in Italy, and 72 in the U.S. by 2050 to maintain the 2015 or so ratio of workers to retirees. With Social Security and Medicare dependent on transfers from workers to retirees, something is going to have to give. SS was originally envisioned to basically provide a subsistence income for a short time between retirement and death back when people typically worked most of their lives and retired 5 years or so before they died. Over time – people lived longer and expected more from SS and the FICA tax went up to meet that expectation. Nothing is carved in stone as to how to change it – but you can’t get blood from a stone either! You can wait longer to get it or you can pay more into it or you can get less out of it when you do retire. But it has to be some combination of those that fit the realities. In terms of sustainability SS is far better off than Medicare. And plain ordinary Medicare is not in terrible condition – it’s the Medicare Advantage that is killing it because basic Medicare limits benefits and Advantage expands them way beyond what the current premiums and subsidies can handle. But in the end – it’s the same issue. If we want more benefits – it’s going to cost us more and if it’s going to go broke – then we have no choice but to cut benefits. Keep in mind – a lot of Medicare’s problems come from people who never saved enough money for their retirement – even though the govt incentivized it by not taxing money put into retirement. Finally – ALL the other industrialized countries – on the planet earth – have Medicare for ALL – and they all pay 1/2 what we do – and they all live longer. We’re doing something wrong… and the free market ain’t going to fix it. Yes, when 65 was set as the retirement age by of all people Otto von Bismarck, life expectancy was much shorter. This is my absolute favorite example of my beloved axiom that whatever the government subsidies, you get more of. In this case the subsidy is for time in retirement. The solution to our financial dilemma is a big uptick in immigration but don’t tell anybody in the GOP that, they don’t want to hear it. I don’t buy it. The only economic growth that matters is per-capita economic growth. Ireland has a higher per-capita GDP than the US and a fertility rate of 1.94 births per woman (down from 4 per woman in 1970). It has the fastest growing per-capita GDP between 1990 – 2014 among developed countries. While it may seem counter-intuitive right now I think that advances in automation will cause great hardship to countries which jacked up their populations through either high fertility rates or very liberal immigration. I wasn’t a math major but I’m pretty sure that 2030 is 12 years from now. An interesting point. We actually want fewer people so there will be fewer working age people displaced by automation. I for one welcome our new robot overlords. . . I disagree with your assessment, at least in part. The U.S. system is far from free market. A case in point is on the supply side where the AMA essentially acts as a cartel that sets the supply of doctors and limits procedures and services that can be done by alternative, less expensive resources like Nurse Practitioners. This results in doctor wages that are the highest or close to highest in the world, in most cases by a huge margin. Free markets do not exist when there are price-setting monopolies. In other industries and in other countries, the government has intervened to restrict monopoly power and it should do so here. That is but one example, but there are numerous others, including huge interventions and distortions with subsidies. re: ” The U.S. system is far from free market.” You’re TOTALLY CORRECT but out of 200 countries on the planet – only 30 or so have govt-sanctioned health care and the rest – more than 140 operate primarily as free markets and can you name one that “works” the way you advocate? If a TRUE free market – people who are sick or old do not get insurance. They just die. Can you really reconcile your advocacy of a TRUE Free Market if that is the case? i.e. that people with health problems won’t be able to afford insurance and without Medicare from the Govt – people who reach older ages also will not be able to get insurance. That’s how real free markets actually work. That’s the way health care works in almost all the countries that 3rd world. That’s the problem. People say “free market” for health care but when you get to the nitty gritty issues like no coverage for the older or sick – they then talk about a “modified” version… right? If a TRUE free market – people who are sick or old do not get insurance. No, that’s a free market only in LarryWorld. There are two levels of analysis here. First is the insurance market. Second is the market among providers to deliver medical services. The primary reason that the market for insurance is so dysfunctional is (1) the underlying cost of medical treatment has gotten so expensive, and (2) government-forced subsidies and cross-subsidies. The reason that the underlying cost of medical treatment is so expensive is government-enforced cartelization of hospitals and the medical professions, the quashing of competition, low productivity growth, and the lack of innovation in health care delivery. Why is health care the only industry in the country with no functioning price system and, therefore, no effective consumer pressure to counter rising costs? Government intervention has made a total and utter hash of our health system. not Larry’s world at all – a “free market” allows the insurance company to determine who to cover and who not to and for what price – without the govt setting rules and prices. Next – health care is NOT the “only non-functioning market”… by a long shot – only in “Bacon’s World” or misguided /confused so-called Conservatives. the most pure free markets are in 3rd world countries where the Govt is “limited” and pretty much stays out of the way of the “markets”. In those markets – one would expect them to “work” like faux-libertarian types claim – and they actually do – because in those countries – if you are sick , have an existing heath issue or old -the insurance company is going to decide if they will cover you or not – and for what price – and the Govt is not going to “save” you – UNLIKE in this country where the Govt protects some people who have employer-provide and allows others who have to buy their own to twist in the wind. You guys WANT the GOVT to do MORE – not less… admit it! You want the Govt to FORCE providers to be “transparent”.. that’s NOT the free market in any way, shape or form. You WANT the GOVT to REQUIRE insurance companies to cover the sick and old whereas in a real free market – the insurance company decides that. come on – admit it…. what you want is not a free market – it’s your PRETEND version of it! Larry, you certainly don’t know anything about the entirety of what I would advocate, so don’t pretend even for argument’s sake that you do. My post was very focused and you need to stay close to that point if we are going to have any sort of meaningful dialog. First of all, I argued that the U.S. health system is not free market. The typical definition of a free market assert that that supply and demand is free from government intervention or price-setting monopolies. What any economist would see is quite the opposite. The government, with significant influence from special interests, has injected itself into both the demand side and supply side of health care. The example I gave of is where the AMA has influenced government to allow it to act as a cartel in determining the supply of doctors by controlling licensure. This has resulted in the highest overall doctor compensation rates in the world and an estimate shortage of about 90K doctors, largely in primary care. It has also resulted in restrictions in procedures and the supervision of procedures by less-expensive, alternative sources like nurse practitioners. (Note that this practice is widely used in other countries to keep health care costs down.) To put this in context, even if we moved to a single payer system, it would not directly fix this severe supply side problem. Izzo. In advanced economy countries – there is much less a free market than in countries that have more limited govt, much lower taxation and just fundamentally are poorer countries without an ability for the govt to be involved in health care beyond basic clinics. The life expectancies between advanced economy nations and others reflects this. The countries with the LOWEST health care costs as well as the longest life expectancies are the countries with the Govt most heavily involved in healthcare and almost no “free markets” in healthcare. the above 3 are not “dreaming” – they are REAL in more than 3 dozen countries… where the”free market” is NOT at work in keeping prices low – the Govt is. I can do better on the dialogue.. I tend to be a little sharp around the edges ..but when we advocate – we ought to be dealing with the realities – not our beliefs… which are fine things but they’re not the reality when it comes to health care. 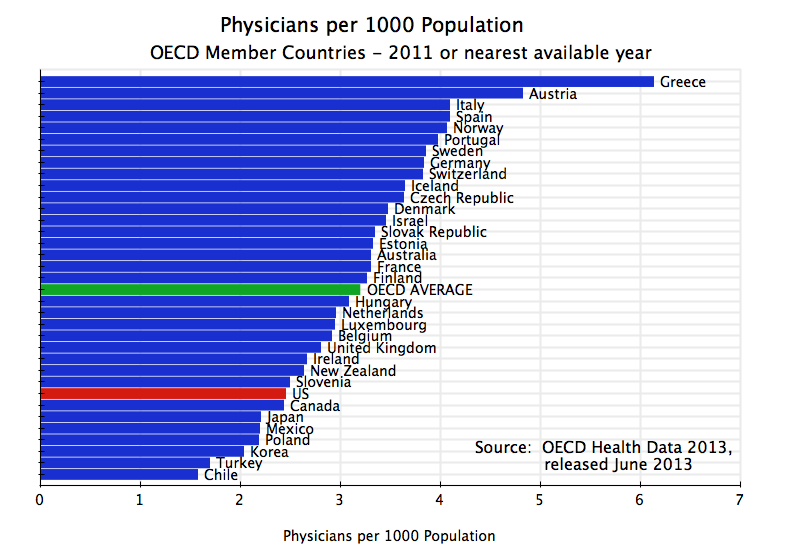 Europe has way, way more hands-on control of the doctor supply than the AMA does here – and their health care is cheaper and better… people pay less and live longer.. what other metrics really count when judging the effectiveness of a mythical “free market”? You would think – that in those places where the govt is more limited and less involved in health care that the “market” would “work” better – no? So show me some of those places where the Govt is less involved and the free market IS able to accomplish what you say it could if it had less govt? Come on – you gotta honestly deal with this… and get away from the ideology… Name the countries that do health care the best because the govt allows the free market to work…. or admit .. you’re living in LA LA Land like a lot of other faux-libertarians and double-talking conservatives! Larry, government expenditure on healthcare in the U.S. is 63% more per capita than it is in the UK. Based on that, it is inaccurate to characterize the U.S. in that regard as “less involved” or free market. If you just say the U.S. system is an inefficient mess, I certainly have no issue with that. I think it is messed up on multiple levels (including use of non-profit status by health care systems). But I think you are off base when you characterize the U.S. system as free market if you are applying the term properly. Izzo – I’m NOT characterizing the US as a free market at all..but I also don’t think the changes being suggested will make us one – either – because of other things that are not free market that have an even bigger effect… and I point out that these “ideas” suggested actually do happen in other countries with far more limited govt and it does NOT result in less expensive costs and better health outcomes.. they’re 3rd world countries with very limited govt involvement and a much truer free market ..
so all these other countries that have more doctors per capita…are they “free markets”? should we expand that list to include the 3rd world countries? Do you think the 3rd world countries will have more doctors per capita? So – the premise that health care would be less expensive if we had more doctors ? Certainly true in the other industrialized countries but is that a result of “free markets”? The likelihood is in the countries that have more doctors per capita, they have not allowed a special interest with a vested interest to act as a cartel by controlling licensure as has happened in the U.S. This results in fewer doctors and higher prices. I think I’ve said that elsewhere. The AMA also significantly influences the scope of practice and level of supervision of other care providers like nurse practitioners. These alternative care resources do not appear on the chart you show. There are multiple market components to healthcare (you seem to think of it as one market and are binary on free market designations). One of the components is the supply and demand for doctors, the one I cited. You can see demand is high because doctor wages are high. You can see potential supply is very high because there are so many qualified applicants to medical school. Control over professional licensing significantly reduces supply (shifts it left) to a much greater extent I would argue than any other country. This raises prices. Government has played a role in the U.S. in limiting monopolies (e.g. Sherman Act) and cartels, improving market efficiency. It has failed here.